It is inseparable from human nature to hope and to fear. In speculation when the market goes against you you hope that every day will be the last day and you lose more than you should had you not listened to hope to the same ally that is so potent a success-bringer to empire builders and pioneers, big and little. And when the market goes your way you become fearful that the next day will take away your profit, and you get out too soon. Fear keeps you from making as much money as you ought to. 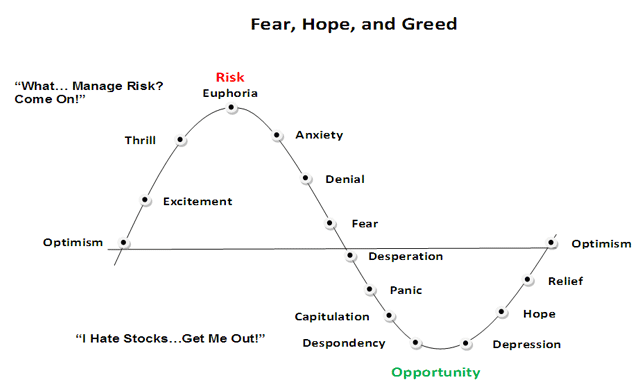 The successful trader has to fight these two deep-seated instincts. He has to reverse what you might call his natural impulses. Instead of hoping he must fear; instead of fearing he must hope. He must fear that his loss may develop into a much bigger loss, and hope that his profit may become a big profit. "Don’t take action with a trade until the market, itself, confirms your opinion. Being a little late in a trade is insurance that your opinion is correct. 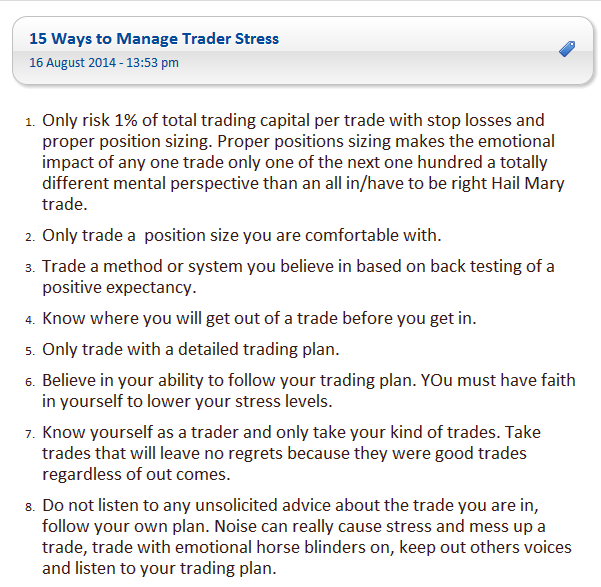 In other words, don’t be an impatient trader." NIFTY closes at lifetime high. Advance decline was marginally negative. Option writing points to support at 7800 and resistance at 8200 (SEP series). In the last few weeks, many stocks have started correcting. 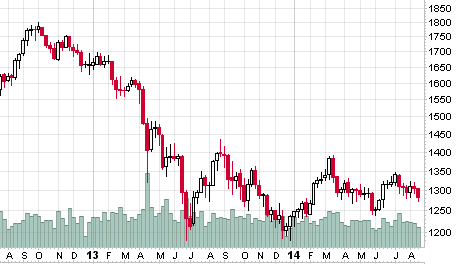 Now the best exit is when a stock breaks its recent support or something like say its 10 or 20 day low. Another strategy is to look at an above normal percentage decline in a stock (say 10-20%) in a single day. I have listed charts of today's top losers (filter: 5 day average volume > 5 cr). For convenience I have drawn the recent support as well as plotted the kplswing indicator on the chart. Trend is up with support at 7540. Minor supports exists at 7800-7850 range. This rally from 7540 has taken 12 days... so for any trend reversal, 7540 must break in less than 12 days. 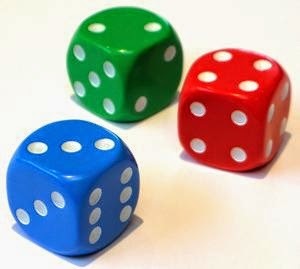 There is a random distribution between wins and losses for any given set of variables that defines an edge. In other words, based on the past performance of your edge, you may know that out of the next 20 trades, 4 will be winners and 12 will be losers. What you don’t know is the sequence of wins and losses or how much money the market is going to make available on the winning trades. This truth makes trading a probability or numbers game. When you really believe that trading is simply a probability game, concepts like “right” and “wrong” or “win” and “lose” no longer have the same significance. As a result, your expectations will be in harmony with the possibilities. Explanation: a trading system may generate 4 winning trades and 12 losing trades. You will never know in what order this will happen and how much you will earn in the winning trade. For eg., you can have 12 consecutive loss making trades followed by 4 winning trades. Further, the winning trade may generate different profits and profit from one trade may cover losses of all previous trades. You can always define your loss in advance and exit if a trade goes wrong. No matter what system you follow you will never know with certainty, the number of winning or losing trades which will happen, the order in which this can occur and the extent of profits in any trade. 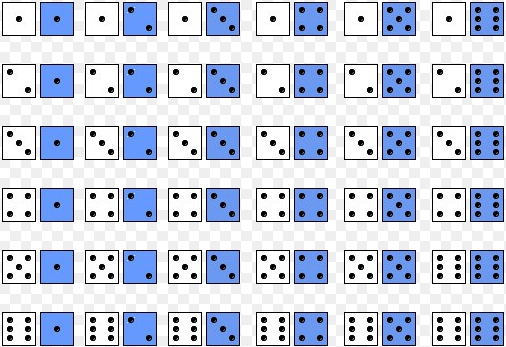 Because of this, trading is a game of probabilities. Once you realize this, you will not be attached to any trade or its outcome. Broader trend is up with support at 7540. 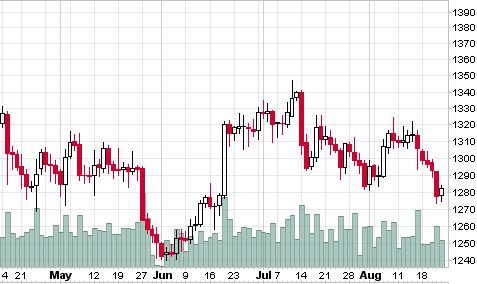 GOLD is resuming its previous trend... i.e. down after its inability to sustain above 1330. In the process it has broken 2 swing lows and formed 2 lower swing highs. On weekly charts we are seeing trading in a triangle... here we have support at 1200 and resistance at 1400. Both these levels are far away and while the trend is down, this sort of trading is indicative of support coming in at lower levels. Too early to be bullish. A picture (or chart) is worth a thousand words. Just see the amazing breakout we have just had. Any doubt? Visually obvious that (a) markets are at the beginning of a new bull run and (b) 6000 will provide excellent support. You don't need to be some clever analyst or a rocket scientist to figure this out. How do you want to play this rally? By buying calls or futures? Or by buying puts. Or doing it the sensible way - buying stocks and taking delivery (the good old fashioned way). NIFTY gives a breakout and closes at weekly high. BNF closes at lifetime high... close above 15700 or more precisely 15800 will be strongly bullish. Reversal level will be 14700. Trend is up and will reverse on close below 7540 spot. Advance decline was marginally positive. Immediate support is expected near 7750-7800... my feeling is this level will not break this series. Let's see. Option writing points to support at 7800 and resistance at 8000. 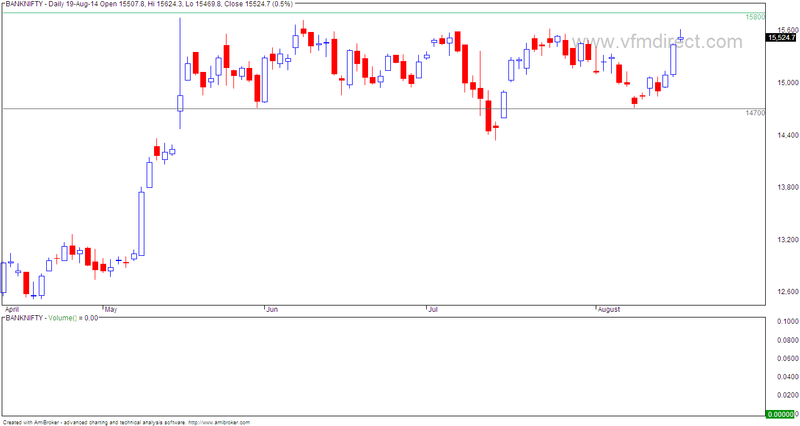 Broader trend is up and will reverse on close below 7540.
nifty is on life time high can he sustain on it ??? BNF is trading rangebound between 14700 and 15800. Broader trend is up and will reverse on close below 14700. Trend is up with support at 7540 spot. Next support 7450. Unless 7450 breaks in less than 7 days consider trend as up. Markets close at new lifetime high.... next target 8000-8400??? Question: Sir. I want to put small StopLoss instead of 10% or as u mentioned above in Daily timeframe. Any suggestion ? Markets close at weekly high and possibly generate highest close (weekly charts). Coming ahead of a 3 day weekend this is a good sign. Now on daily and weekly charts, trend is up with support at 7450 spot. Broader trend is up with SL at 7450... poor advance decline indicates selling at higher levels. Question: is mid cap rally over? Broader trend is up with support at 7450 spot. 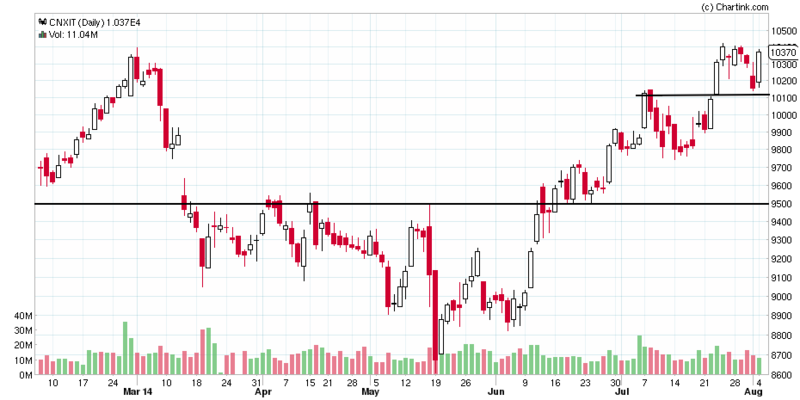 Immediate resistance at 7800 breakout above which can lead to a rally to 8000 levels. Several times, we encounter a situation where a trade gives nominal profits or a loss. We then develop a tendency to ignore the next signal as the previous one had failed. This is also somewhat similar to Gambler's fallacy. Broader trend is up with support at 7450 spot. Question: Which Indicator do u follow ? KPL Swing, Donchian or any other ? Markets gap down but trade in a very small range. This is actually a bullish sign and will be confirmed if we have a gap up opening Monday. 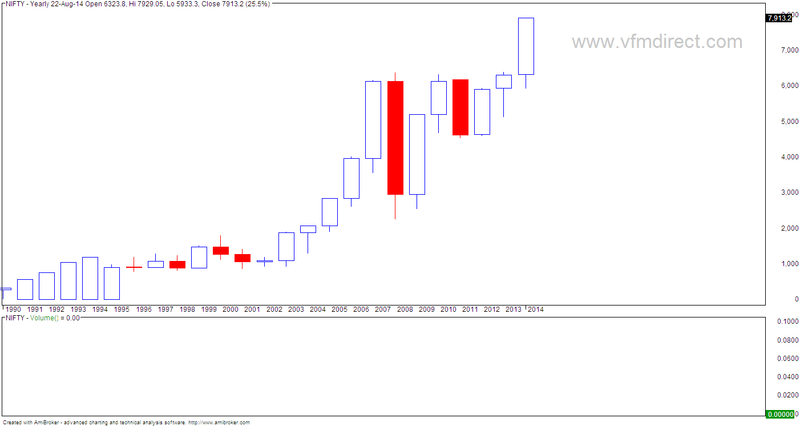 This is the weekly chart for GOLD in USD. While the broader trend is down, GOLD is trading in a big triangle (timewise) for almost a year. NIFTY is at the same place where it was 2 months ago... so if you had gone on a vacation 2 months ago and returned today, you have missed nothing. While the short term trend is down, it is prone to whipsaws as the moves are showing overlapping legs. Rally stalls. Ideally markets should have staged a smart rally but this did not happen. On the other hand, yesterday's low did not break. Broader trend is up with support at 7450 spot. Minor support exists at 7600 so if this breaks a lower swing high would have been formed. I have written a lot on position sizing and have found this to be one of the most important and yet neglected aspects of trading. Today I will write about using position sizing for options. Options seem to be very popular with retail investors for various reasons. Note that yesterday market was bullish and today was no exception. 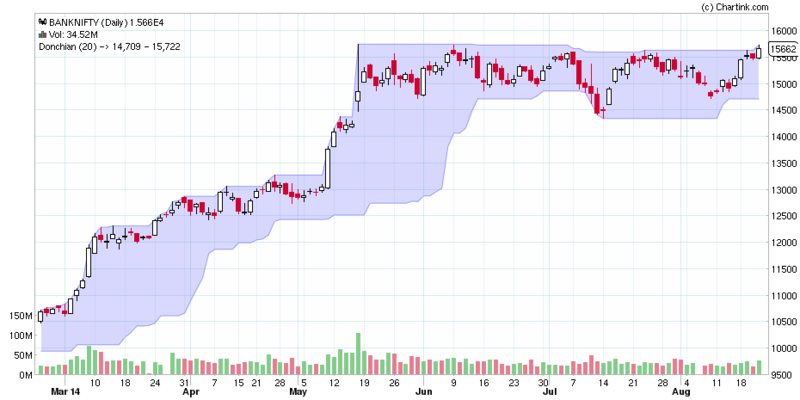 EOD chart shows buying at lower levels and also formation of higher high and higher low. So broadly speaking, trend remains up as long as nifty trades above 7450 spot. First buy signal was posted on 19-JUN. Now trend is still up with SL at 10100. Trend is up and will reverse on close below 7420. Note today's bounce has come from 61.8% retracement level. So going forward, Friday's low become important. Option writers are bullish and do not expect 7300 to break this series. NIFTY closed 2.4% in the negative this week of which 1.5% loss happened today.